Just nine games into his NHL career, Elias Pettersson continues to lead rookie scoring on the heels of a seven-point week while setting a franchise record. Earlier praise from Elias Pettersson's former head coach, Sam Hallam, is translating to the NHL just as well as the Vancouver Canucks rookie's game itself. Those words were spoken after Pettersson passed Kent Nilsson for most points by an under-20 player in SHL history. The Swedish standout scored four goals in three games – tied for most in the league – as part of a seven-point week that led his team in scoring (4-3–7), while earning a franchise record with a five-point night. 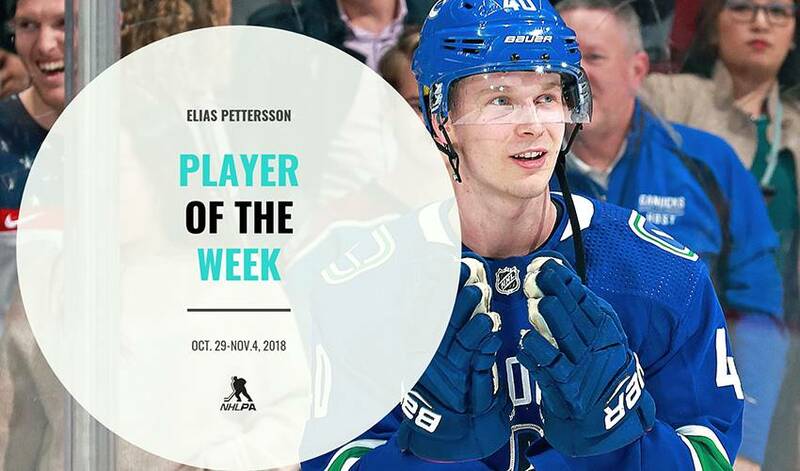 Pettersson was also named the NHL's Rookie of the Month for October despite missing six games with a concussion. Now just nine games into his NHL career the 19-year-old is an early Calder Memorial Trophy favourite as he continues to lead NHL rookies in scoring (9-6–15) while leaving head coach Travis Green, along with the rest of the hockey world, at a loss for words. Pettersson started his week with a two-goal effort while putting his defensive game on display in a 5-2 win Monday night that ended the visiting Minnesota Wild's five-game winning streak. "Good defense leads to good offense," Pettersson said postgame after blocking three shots that night and earning the game's first star. "In the defensive zone, if you have to block a shot for us to win, you do it." Though "Petey" was held off the scoresheet for just the second time in his young career the contagious effect of his skill spread to 22-year-old Jake Virtanen, who earned the game's first star by lightning the lamp twice in what was the first multi-goal outing of his NHL career. "I felt like I was pretty confident tonight," Virtanen told reporters postgame. "I watch Petey pretty closely. You see a young guy come in and score goals, and it boosts you a bit. You want to keep up with a so-called young guy." Pettersson's five-point night was not only a personal best, but it set a franchise record for the most points in a regular-season game by a rookie. He also became the youngest player in Canucks history with at least five points to his name in a regular-season game. After assisting on a pair of goals by Vancouver's Brock Boeser, including a bank pass off the end boards that would make the Sedins proud, Pettersson scored his first game-tying goal to end the middle frame at 4-4. With time quickly dwindling away in the third period, Pettersson wired home his second goal and fourth point of the evening to force overtime with a 6-6 tie and just :36 left on the clock. His final point of the night came on teammate Derrick Pouliot's overtime game-winner, bringing a frenzied Rogers Arena to its feet. "I got goosebumps when we tied the game late," Pettersson said postgame after being named the game's first star. With three straight wins at home in the books, the Canucks hit the road for a six-game road trip, during which Pettersson will have his 20th birthday. Puck drops Tuesday at Little Caesars Arena at 7:30 PM ET.